Who doesn't love a cool racing tee? Stéphane Dufour's 8Bolt line turns iconic racing moments into stylish, wearable art. These handsome tees are 100% cotton and screenprinted in the USA. Perfect for Father’s Day! See the full selection of shirt designs here. To get your discount, enter promo code 8BOLT10 at Step #4 during checkout where it says, “Have a Promo Code? Apply it Now.” Offer valid until 6/21/16. 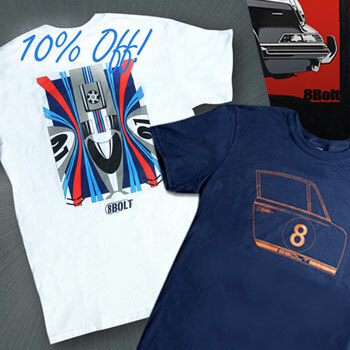 Quick Reply: 10% Off 8Bolt Racing Tees!